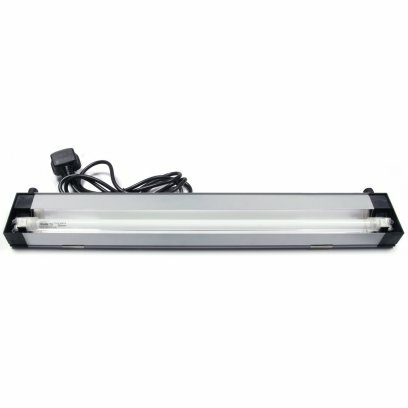 The Arcadia Reptile 54W High Output (HO) T5 Lighting Kit is an easy to fit, easy to use system that arrives complete with the electronic lamp bar with independent switch, specialist Arcadia Reptile HO-T5 reflector and your choice of German made branded Arcadia Reptile HOT5 UVB lamp. This easy to use system even includes a FREE link cable in every box, as such you can link together up to 10 units from one power supply. The Shade Dweller MiniT5 by Arcadia Reptile is the perfect choice for those that use shallow vivaria and would like to incorporate essential UV-B. This easy to fit kit arrives complete with flicker-free electronics, specially made flat reflector, fittings kit, power cable, switch, linking cable and the 7% UV-B, 8W ShadeDweller lamp. 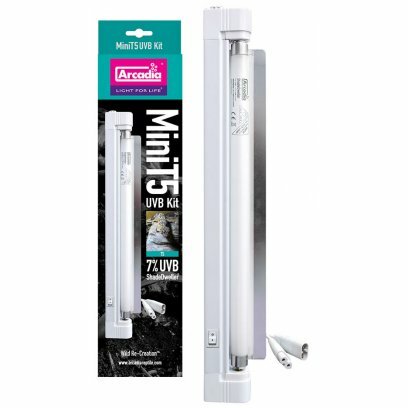 ShadeDweller MiniT5 will allow you to fit UV-B within vivarium?s that may once have been too shallow to allow safe fitting. Its low profile and effective reflector will enable you to provide the perfect UV Index at 20-30cm from the lamp to the animals back, when seated at the basking point. The kit arrives with a single power cable and a further link cable which allows you to link up to 10 units from one power source. Lamp changes are simple via a simple insert and twist lamp holder. It's perfect for enclosures up to 12"/30cm high. ShadeDweller MiniT5 is the perfect choice for crepuscular species such as the leopard Gecko or even hatchling snakes when kept in shallow enclosures, racks or tubs. ShadeDweller is also suitable for use with Amphibians and Inverts. For far too long Crepuscular animals have not had dedicated lighting systems, ShadeDweller by Arcadia Reptile seeks to right this wrong. 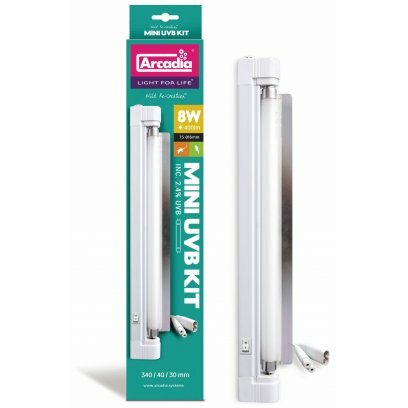 The Arcadia Reptile Shade Dweller ProT5 Kit is a sleek, attractive, highly versatile and dedicated UV-B lighting kit with the needs of modern reptile keeping at its heart. Shade Dweller ProT5 is equipped with a highly functional but removable curved reflector that ensures a UV rich basking area directly beneath the unit. The ShadeDweller ProT5 arrives with the Arcadia Reptile 17% UV-A, 7% UV-B ShadeDweller 8 Watt lamp, switch, fittings kit, a single power cable and a free link cable to allow you to run up to 10 kits from one power source. 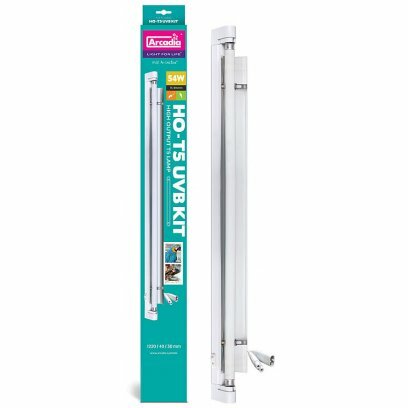 This easy to use professional lighting kit can be easily fitted into a wooden vivarium with the fitting kit that is included, or, it can placed above the mesh of a glass vivarium for climbing species such as Crested geckos and more. 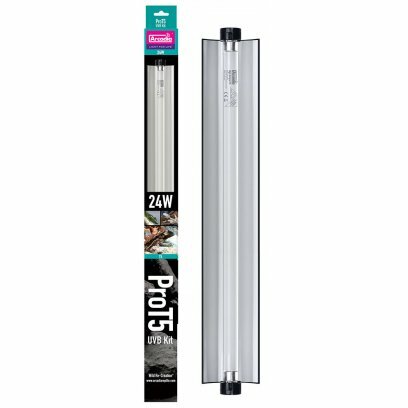 The ShadeDweller ProT5 kit will help you to provide adequate levels of essential UV energy beneath the lighting kit and over a targeted area. This will allow you as the keeper to provide targeted areas of light and shade in which your animal can self-regulate within standard sized enclosures. ShadeDweller ProT5 is fast start and flicker-free. For far too long Crepuscular animals have not had dedicated lighting systems, ShadeDweller by Arcadia Reptile seeks to right this wrong. ProT5 is a highly adaptable lighting kit with high quality internal electronics, a high effective but removable reflector, power cable, fittings kit, free link cable and your choice of Arcadia Reptile HO-T5 UV-B lamp. This easy-to-use kit can be fixed easily inside of a vivarium, rested upon a wire meshed glassed terrarium, hung above an enclosure or hung within (where safe to do so). Its sleek design and specially curved reflector will ensure that you take up less space but project as much light forward as possible. The Kit also arrives with a free link cable which means that multiple units can be powered from a suitable single power source. Pro T5 is small but mighty. This is due to the type of reflector that is included. Easy to remove and clean, the reflector has 2 angles of reflection from each curve. This means that it projects high levels of UV-rich light directly beneath unit at around 12"/30cm to create a basking zone but then light also spreads out over distance to provides a wide flood. This will allow you to create a suitable UV-B provision for any species and over a suitably wide area. The Arcadia Slimline High Output T5 UVB fitting is a plug in, ready to use, reptile keeping miracle. It is suitable for all Vivaria and Terraria over 2 feet in length, and for use with all exotics. Using just one water resistant removable power socket this T5 unit is very neat and tidy in the vivarium and very easy to fit. The unit itself with the highly effective built in T5 reflector, one screw removable mounting plates and even an Arcadia Reptile D3+ 12% UVB High Output T5 lamp! Lighting for Reptiles and Amphibians with UVB has become a definite science and as tech improves we can match captive reptile?s needs to the best of our abilities. This really is a one stop solution to all of your high output reptile lighting needs. Generating a photogradient has never been easier. Simply fit the Slimline T5 fitting inside your viv at the front edge between the roof and the front plate above the door and offset into your hot end as per our ?Lighting Guide?. This will provide you with a no fuss, high output source of UV rich lighting that is well out of your view but very usable by your pet reptiles and amphibians. You can even connect more than one unit up and still only use a single power source with the daisy chain leads. Simply power one unit up from the mains and run another off of the first unit. This is a space saving, energy efficient way of providing multiple lamps over large enclosures or running a pair of lamps to help with live plant growth. Using just one water resistant removable power socket this T5 unit is very neat and tidy in the vivarium and very easy to fit. The unit itself with the highly effective built in T5 reflector, one screw removable mounting plates and even an Arcadia Reptile D3+ 12% UVB High Output T5 lamp! 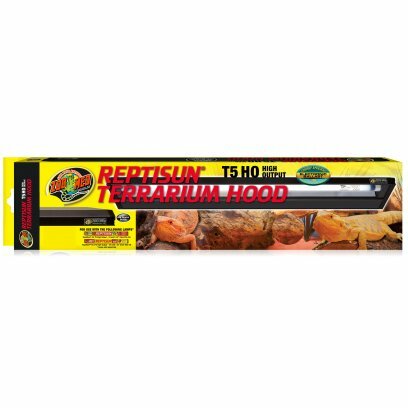 Includes Arcadia Reptile High Output T5 Reptile Lamp. The Arcadia Slimline High Output T5 UVB fitting is a plug in, ready to use, reptile keeping miracle. It is suitable for all Vivaria and Terraria over 2 feet in length, and for use with all exotics. Using just one water resistant removable power socket this T5 unit is very neat and tidy in the vivarium and very easy to fit. The unit itself with the highly effective built in T5 reflector, one screw removable mounting plates and even an Arcadia Reptile D3+ 14% UVB High Output T5 lamp! Using just one water resistant removable power socket this T5 unit is very neat and tidy in the vivarium and very easy to fit. The unit itself with the highly effective built in T5 reflector, one screw removable mounting plates and even an Arcadia Reptile D3+ 14% UVB High Output T5 lamp! The Arcadia Slimline High Output T5 UVB fitting is a plug in, ready to use, reptile keeping miracle. It is suitable for all Vivaria and Terraria over 2 feet in length, and for use with all exotics. Using just one water resistant removable power socket this T5 unit is very neat and tidy in the vivarium and very easy to fit. The unit itself with the highly effective built in T5 reflector, one screw removable mounting plates and even an Arcadia Reptile D3 6% UVB High Output T5 lamp! Using just one water resistant removable power socket this T5 unit is very neat and tidy in the vivarium and very easy to fit. The unit itself with the highly effective built in T5 reflector, one screw removable mounting plates and even an Arcadia Reptile D3 6% UVB High Output T5 lamp! 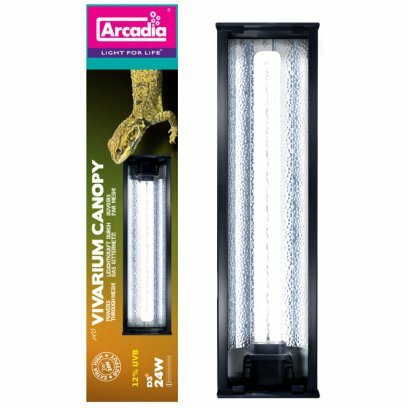 A revolutionary new high performance T5 reptile lamp from Arcadia, that powers through mesh! 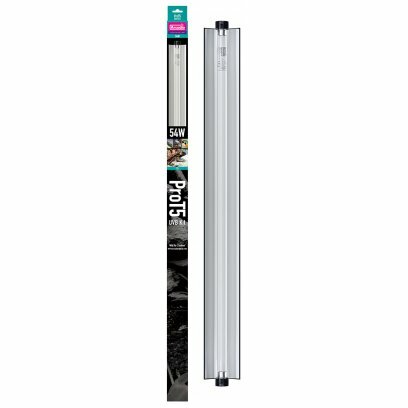 This product offers a significant increase in both visible light and UV output compared with T8 lamps of similar length. Reptiles use light and heat in an array of miraculous ways. They use UVA to help view the world and UVB to start something called the D3 Cycle. This is the process of a reptile being exposed to heat and natural sunlight after a period of rest. The UVB wavelength penetrates the skin and starts a chemical and hormonal chain of changes that ends up with the production and assimilation of vitamin D3. Vitamin D3 allows the absorption of calcium. Many reptiles are kept in great glass vivaria with metal mesh tops. Anything that is placed in front of a light source will inhibit the downward pathway of the light provided. 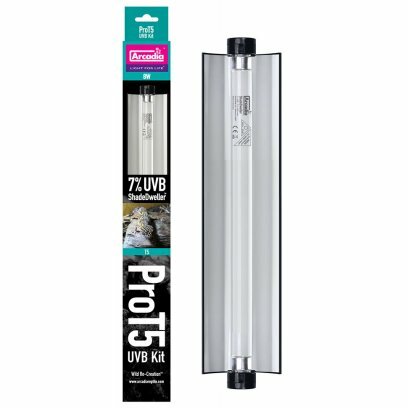 In the case of UVB emitting reptile lamps this means less light and less UV. It has also been shown that the levels of transmission decrease as time goes by. This can be due to a build up of dust and or rust. It is important that these mesh tops are cleaned regularly to ensure as much light as possible can pass through the mesh. Arcadia Reptile are proud to include a range of Metal vivarium canopies. Not only did we win best new reptile product of the year for this range but they have gone on to critical acclaim in homes all over the world. These full metal units utilise the very latest of High Output technology. UV decreases in power massively the further from the lamp the light has to travel, if a mesh is placed in front of these lamps the decrease is even more serious. Arcadia Reptile is THE home of the worlds best HO T5 lamps. By using these award winning lamps we ensure that enough visible light and UV is introduced into the living area. Typically using the Arcadia Canopy will not only mean a brighter, easier to view enclosure, but better animal colours, feeding response and animals that are more willing to breed. These units are IP67/waterproof and are totally safe to be used with all commercial mister and fogging units. The sleek black design will look great in every household. 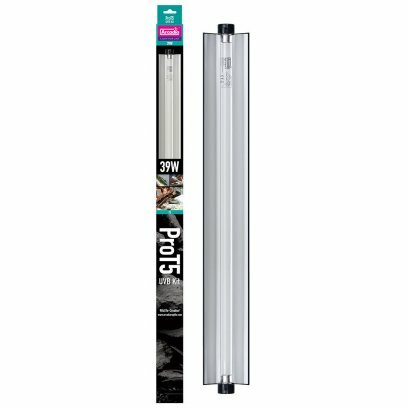 The new T5 light canopies utilize the new more compact T5 fluorescent tubes to create a streamlined terrarium hood with a far greater UV output. These are the currently the best way to get UV into your terrariums.